A museum patron looks at a coffinette for the viscera of Tutankhamun at the Tutankhamun and the Golden Age of the Pharaohs exhibition at the de Young Museum February 18, 2010 in San Francisco, California. The results of a DNA study and CT scans on the 3,300 year-old mummy of Egypt's King Tut showed the young king had a club foot and died from malaria. Further DNA testing suggests that two stillborn fetuses that were found in Tut's tomb are likely to be his children. King Tut's chariot has arrived in the U.S. and will be on display in Times Square starting this morning. The chariot joins the "Tutankhamun and the Golden Age of the Pharaohs" display at the Discovery Times Square Exhibition. Although several chariots were buried with the famous boy king, it seems that he favored this one. Forensic specialists say this chariot was the only one in Tutankhamun's tomb that showed signs of use. 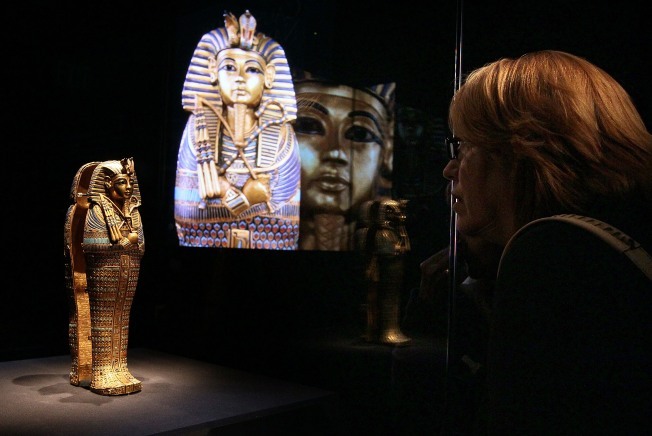 Because Egyptian officials were initially concerned that the chariot was too fragile to travel, the rest of the King Tut exhibit reached NYC in April, leaving the chariot behind in Egypt. Even so, hopeful Discovery officials created a special room for the chariot with a climate-controlled case for when it arrived. Approval for the move came just last week, and the chariot was subsequently packed up and put aboard a Lufthansa cargo jet to JFK Airport, the New York Times reports. King Tut probably never got the ancient Egyptian equivalent of a speeding ticket--even if they had them, he was the king, after all--but officials pulled the chariot over on its journey to Times Square, Senior Vice President of Arts and Exhibitions International Mark Lach told the Times. Because the chariot was registered as a 'vehicle' with the airline, JFK officials pulled over this second millenium B.C. hotrod at the airport and asked for its Vehicle Identification Number. "I'm totally serious," Lach told the Times. "But we got it cleared up." The chariot may also have played a role in Tutankhamun's death. Forensic scientists debunked the rumor that the teenaged king had been murdered; the hole in the back of his skull happened after the burial, according to the autopsy. Prior to that investigation, scientists speculated that Tutankhamun's chief advisor had the eighteen-year-old murdered in order to seize power. Instead, the scientists determined that Tutankhamun had fragile bones due to a degenerative disease, and that his death was probably due to a severely broken leg and subsequent malarial infection. Since the tomb was discovered in 1922, however, people around the world have speculated about not only Tutankhamun's dubious death, but the "Pharaoh's Curse" allegedly guarding his grave. The last time a King Tut exhibit toured the U.S. was in the 1970s, when it touched off a 'Tut-mania' that would put fellow underage celebrity Justin Bieber to shame. Museum-goers waited up to eight hours to see the exhibits, and meanwhile 'Egyptian'-themed parties and horror films about vengeful pharaoh curses were all the rage. But Tutankhamun's American fandom is perhaps epitomized in Steve Martin's famous "King Tut" song, which was a top 20 billboard hit.